If you’re in most parts of the country, you didn’t need a groundhog to tell you this year that Winter is far from over. We’re officially hitting the doldrums of the year, which means people are less enamored with fancy lattes, new sweaters, and fresh snow, and they’re more ready than ever to finally soak up some sun. This can be an especially frustrating time if you spend a lot of time tinkering around outdoors in your garden, yard or driveway, working on projects. The good news? 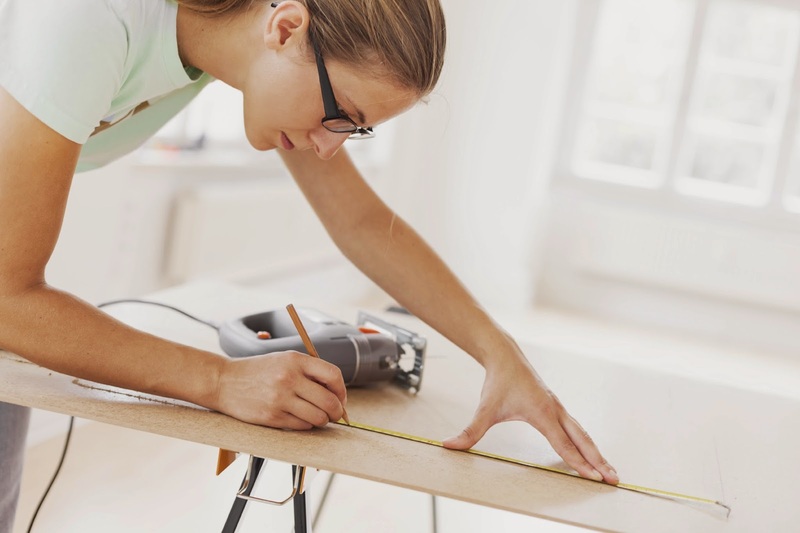 You don’t have to wait for the good weather to arrive to get back into the DIY spirit! If you’re lucky enough to have a garage that doubles as a workshop, you’re set: just drag out the space heater and rev up the chainsaw. If not, there are some clever ideas out there about how create a makeshift woodshop in your basement or an unused room. Don’t have that luxury either? Move the furniture, lay down some floor covering, and start apologizing to your family members for stealing the dining room. These short indoor projects will be worth it! Below are a few indoor woodworking project ideas to get your creative juices flowing and keep the winter blues at bay. • Home Improvement Projects – One of the safest bets for a great indoor project is anything home improvement-related. Often these projects, like fixing a door frame or installing more attractive lighting, are so localized that you won’t even need a working space beyond the radius of the actual item you’re working on. It’s also a productive, helpful use of your time – so you’re more likely to receive forgiveness for noisy drilling or hammering. Check out these great home improvement ideas for more inspiration. • Convert Old Furniture Into New – Get fun and creative by re-purposing some furniture you don’t need anymore. Do you have an old crib your child has grown out of? Turn it into a bench. How about an old wardrobe or dresser? Remove the doors and add some shelves for a contemporary and quirky bookcase. Even unused wood pallets can make the perfect bed frames. Use your own furniture or hit the thrift stores and let your creativity shine. If you get stuck, just type in your item of furniture followed by “upcycled” or “re-purposed” on Pinterest and you’re sure to be met with a wealth of ideas. • Get Crafty With the Kids – Why save all the fun for yourself? Enjoy some family bonding time and teach your kids crucial skills that will last them a lifetime by showing them how to build their own birdhouse, outdoor planter, or bench. Allow your children to use their skills to complement each other. For example, if one child is more artistic and detail-oriented, allow them to paint the finished product. Again, look to Pinterest for some great beginner’s woodworking projects. So don’t get down about the weather; get creative! We promise the sun will be out soon. In the meantime, have some fun and then reap the rewards of your work.